Brushing too hard causing gum recession – If your brushing too hard you are taking off more than just plaque. Results of dental procedures – Teeth may become sensitive after fillings, professional cleaning, root canal or replacement of crown or other tooth restoration. But usually settles down in 4-6 weeks. Chances of getting sensitive teeth can be reduced with proper oral hygiene and by consulting your dentist. Inform your dentist about the tooth sensitivity on your regular dental visit. Your dentist will examine your teeth and gums and will identify the causes and the treatment. Not one single treatment can cure tooth sensitivity as there are different reasons for different people. It is also important to tell your dentist in case the cause is not dentin (root) hypersensitivity and the tooth is sensitive due to some serious medical problems. To treat tooth sensitivity, your dentist may recommend that you use a soft toothbrush with sensitive toothpaste. These toothpastes make the teeth less sensitive if you brush with them twice a day and contains fluoride which helps protecting your teeth from decay. Alternatively, your dentist may prescribe a brush-on fluoride gel or a fluoride rinse, or a high fluoride level toothpaste that is specially formulated to make your teeth less sensitive and provides extra protection against decay. You should ask your dentist about the best way to treat your sensitivity. Your dentist will recommend fluoride treatment to strengthen your tooth enamel and may prescribe high strength fluoride toothpaste or mouth rinse. Reducing the intake of acidic drinks and foods also gives relief from tooth sensitivity. Use soft bristle toothbrush to brush your teeth and brush your teeth gently. Brush and floss at least twice a day. Using a sensitive toothpaste helps with tooth sensitivity. Choose an alcohol-free mouth rinse. Sometimes sensitive teeth can be a warning sign for major dental or medical problems. 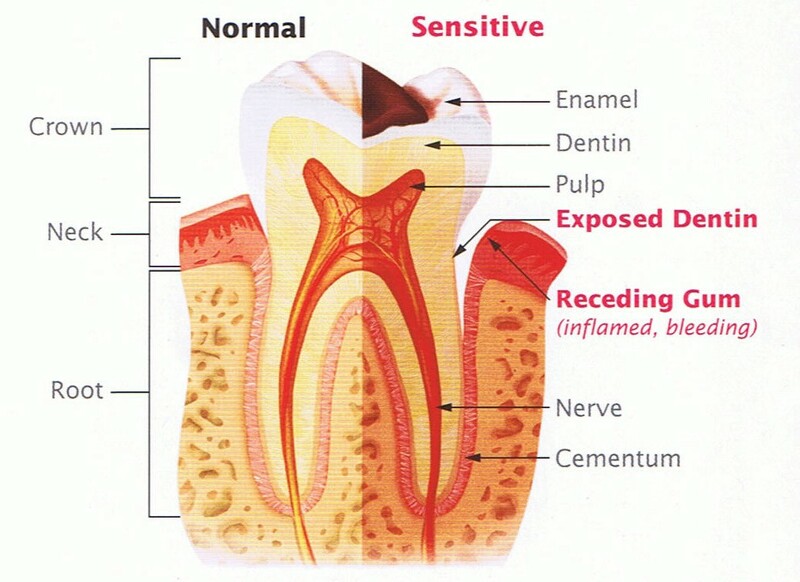 Consult our Gentle Caring Dentists to figure out what’s causing your teeth sensitivity and the best ways to treat it.